Hong Kong. I was very excited when I saw the announcement of Hong Kong’s first luxury furniture design fair to take place at the end of August. So, last Sunday I convinced my daughter Natasha to join me to take a look. The design fair was located in Wanchai, to be exact in Hong Kong’s Convention Center, a very prestigious address that is easy to reach. Usually, larger fairs are staged at the airport which is about an hour away from where I live and thus not as easily accessible. So that was good news. Given the great location and the love of Hong Kongers for luxury, quirky items, glitz and designer names, I had great expectations. 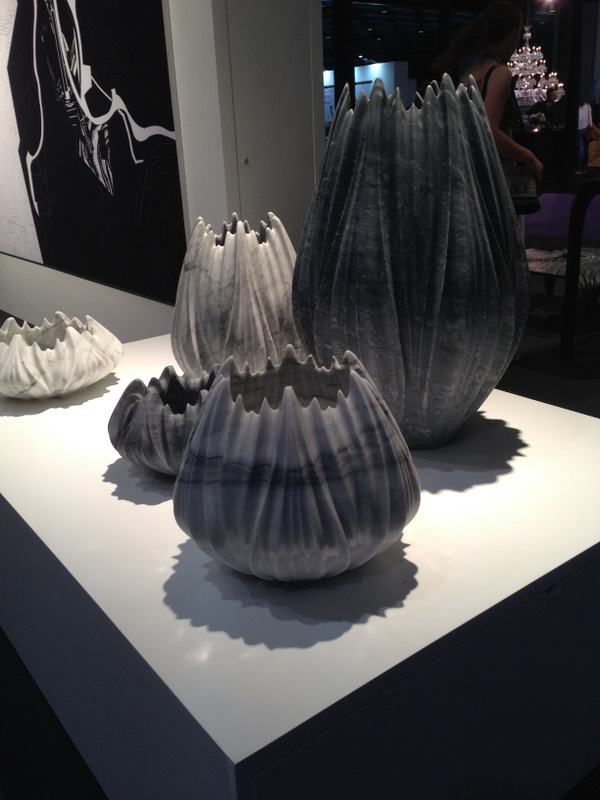 Tau Vase Collection by Zaha Hadid. After getting our tickets we went inside. We were greeted by an eclectic selection of displays by Zaha Hadid’s Design office. I loved her vase collection, free form tables and particularly the shoes. Hadid’s “Flames” Shoes – cool, yes, but wasn’t this a furniture design fair? The latter did not look particularly comfortable mind you (they were more „sitting“ than „walking“ shoes), but I don’t think they were meant to be. The design was – true to Hadid’s style – out of this world and the technology behind their manufacturing, top notch. 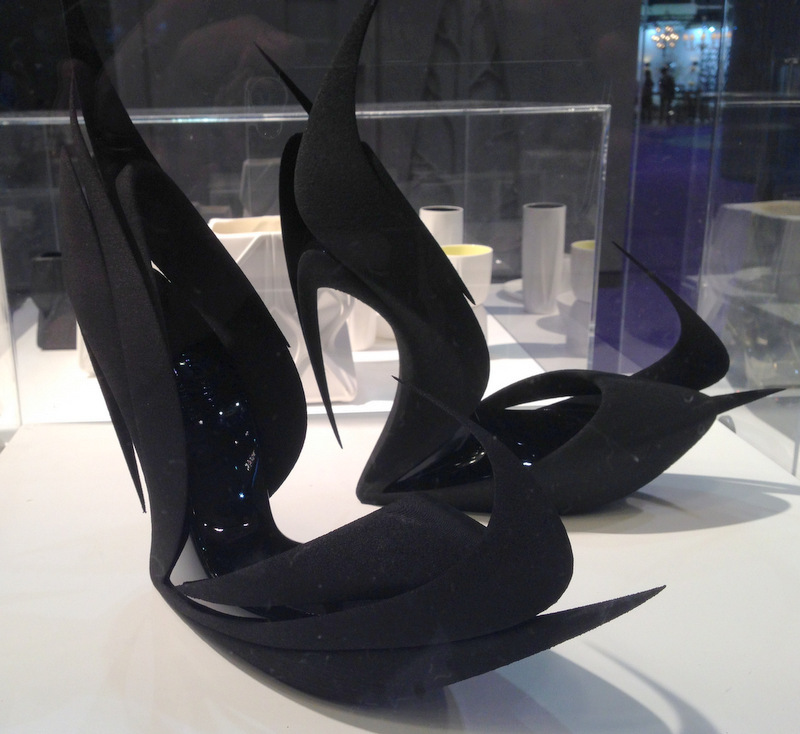 These shoes were 3D printed and looked as if they belonged to Disney’s Maleficent! 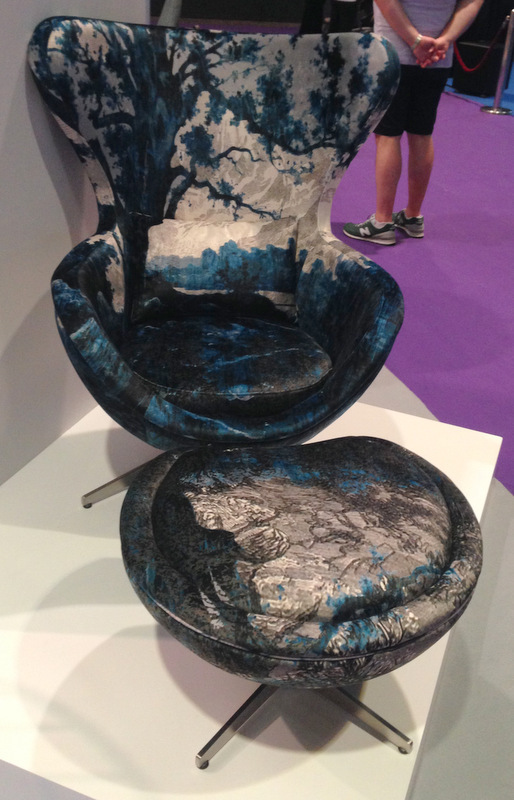 Then we went on – Next was a booth that showcased design as art (Design Commune curated by Arrakis Oggetti): ordinary chairs were turned into pieces of art; fun to look at, but certainly no longer useful furniture. We spent a bit of time there, looking around, but I already started feeling a bit disappointed. I had expected much more in the sense of luxury interior design ideas than what was obviously on display. But maybe that was just me. Some French visitors seemed to be fairly excited about the art displays and discussed them vividly. We moved on to take a look at some other booths. Alno – a German kitchen brand – exhibited a few kitchen islands. One of them had an in-built gas fireplace at one end. A pretty cool idea – I had seen pictures of it (with the fireplace lit) in one of their catalogs. Unfortunately, at the fair, the fire was turned off … thus, I would not be surprised if many visitors had missed it completely. 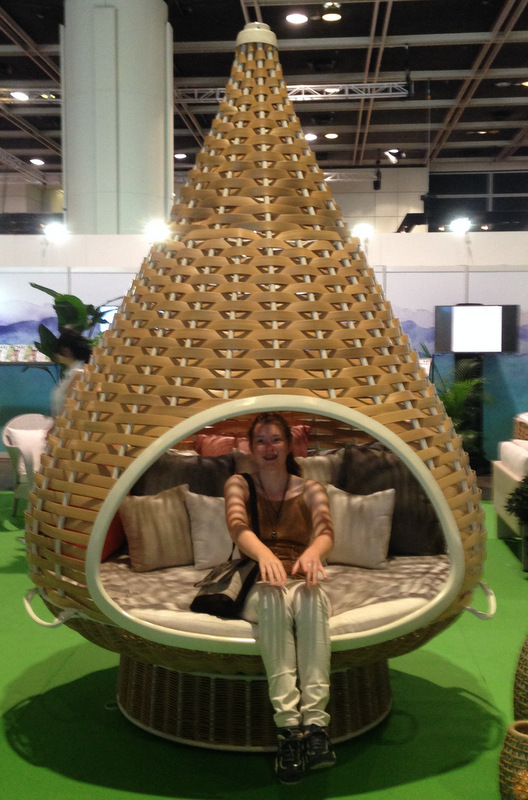 Dedon had a fairly large selection of their outdoor furniture on display. Nice and cosy, but nothing to write home about. Lalique’s wares looked old-fashioned and did not appeal to me at all: cheap looking black glass beads on tan colored linens? Really? A display by bella loco did not meet my expectations either. They seemed to offer everything, but nothing in particular. What is „luxury“ about all that? In one corner they had displayed their version of the Arne Jacobsen’s Egg Chair, upholstered in a soft turquoise, grey, white fabric. 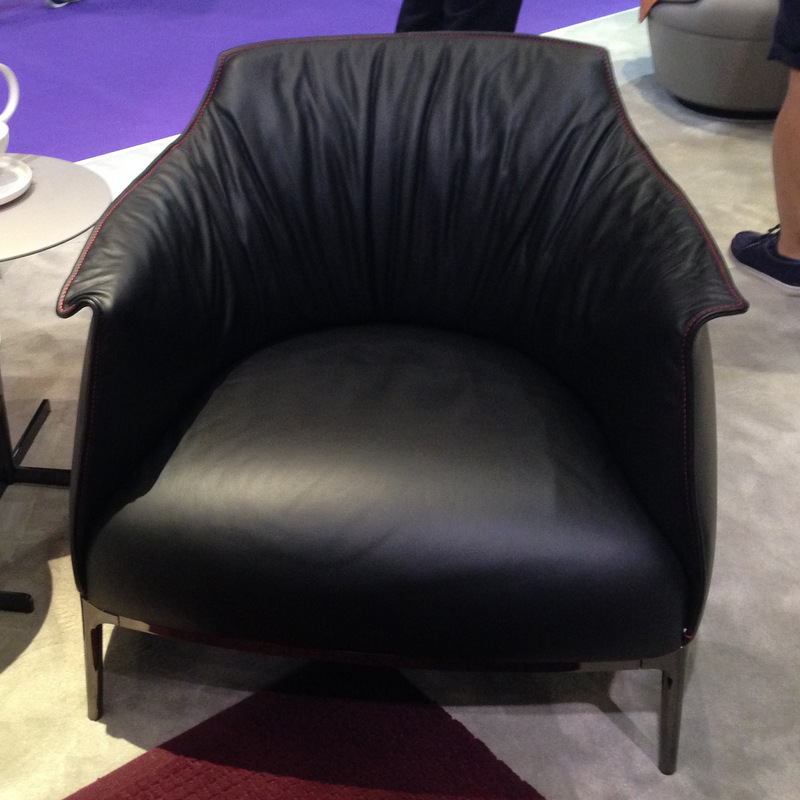 The representative there immediately explained to me that this „was NOT an Egg Chair“ (Ok …!) We finally agreed on that it was inspired by Arne Jacobsen’s design, but featured this amazing „bella loco“-specific fabric called: Polyester! By now, Natasha’s eyes crossed over and I could feel her urge to move closer to the exit. 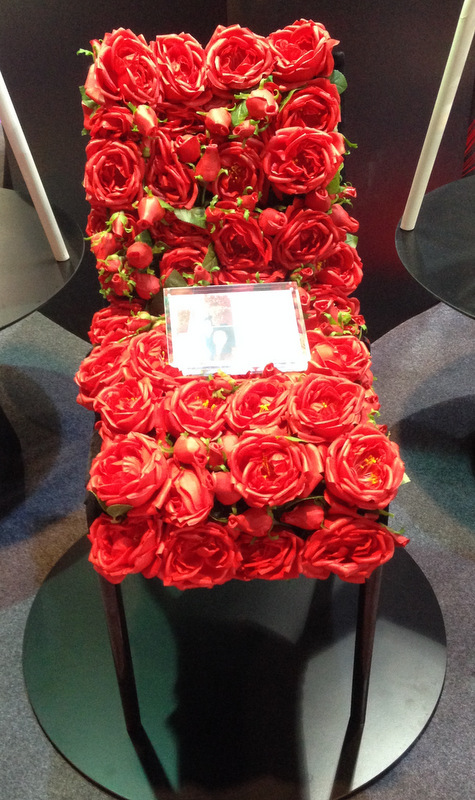 On the way there, we passed Poltrona Frau’s booth. Finally, we identified a few objects that looked both „luxe“ and functional. The accent chairs in cow leather were cute and even fairly comfortable (they could improve on the arm rests though which cut into the underside of your arms when you rest your arms on them). They came in various shapes and colors … In particular the black one with the red stitching may have the potential to earn Poltrona some decent revenue. It reminded me – not by coincidence – of Ferrari’s car interiors. By the time, we left, only a few additional visitors had found their way to the fair. The whole thing seemed to be in the process of winding down fairly quickly. I am wondering whether there will be a sequel next year. If so, I can only hope that both the displays and exhibitors will be more interesting and more related to what you would really expect from a luxury design fair: a broad selection of exciting luxury furniture and accessories displayed in an appealing and inspiring way! ← True Beauty is “Born” , Not Created!